- The Basque flag is located on the back of the neck. Eibar is one of those cool, small football clubs that are fighting against the big giants of their country. 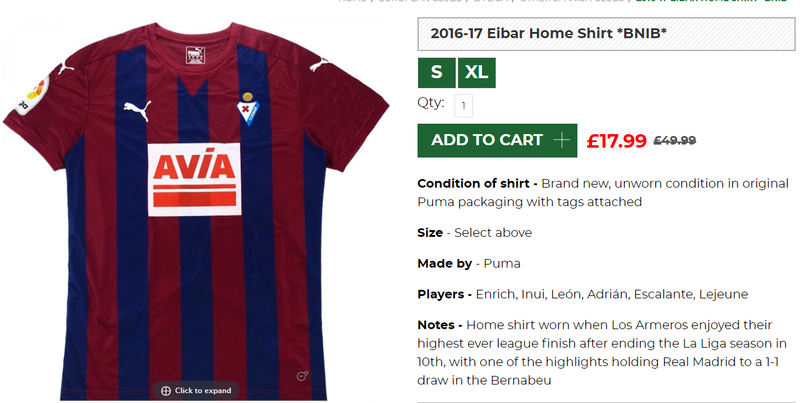 I have had my eye on an Eibar shirt for some time now so when one became available I knew that I had to buy it. The shirt design and style is very typical of a Puma club football shirt. The colouring is nice and I am always a fan of any shirt that adds the flag of the region they are from. The sponsor is a bit striking but other than that the shirt is a welcome addition to my collection. The team plays in claret and blue shirts with blue shorts (originating from the kit of FC Barcelona) and holds home games at the Ipurua Municipal Stadium. SD Eibar is a fan-owned club, with more than 10,000 shareholders from 69 countries all over the world. The club are considered the smallest to have played in Spain's top division and its stadium has the lowest capacity. Eibar is the only football club which has the quality certificate UNE-EN-ISO 9001.